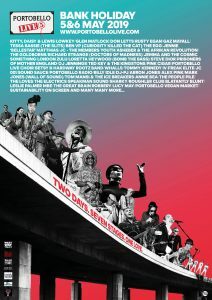 Held over Sunday and Monday of the May Day bank holiday, Portobello Live! 5 provides maximum accessibility for minimum spend. One affordable wristband allows entry to all Portobello Live! venues over two days. Under 16s go free. A great line up of new and established bands and performers, rock royalty, superstar DJs and special guests will perform at Portobello’s iconic pubs, clubs and venues. We are also proud to partner with J P McCormack’s Portobello Vegan, whose market will be serving up delicious food and drink as well as ethical clothing, cruelty free beauty products and vegan artisan delights, and the Sustainability On Screen film festival, showcasing a compassionate and environmentally friendly lifestyle. Movies include the community sustainability-themed Down To Earth and environmental films The Hudson, Urban Mermaid and Celine Cousteau’s Tribes on the Edge. We’ve gone vegan here too, with screenings of Dominion, 73 Cows, The End of Meat and Vegan Round the World. There’ll be discussions and Q&A sessions with leading filmmakers, environmentalists and musicians, exploring the impact of our diet and consumption on the communities we live in, with topics including climate change, waste pollution, plant-based diet and environmental sustainability. Richard Strange (Doctors of Madness), Gaz Mayall, rapper/poet JC001, Annie Bea, Tom Mansi & The Icebreakers, JC -The Members, Steve Dior, Asheber and the Afrikan Revolution, The Goldborns, Pink Cigar, and many many more. Portobello Live!’s status as a Community Interest Company (CIC) is underscored by its very own Portobello Live Choir, which opens proceedings on the Sunday. For the third year at Portobello Live!, Blatantly Blunt are hosting a grime, hip hop and dancehall stage to showcase many of the artists they represent. Aimed at preserving West London’s rich and diverse artistic heritage, the festival provides a deserved platform for the area’s past and present music and cultural history. Venues are all within walking distance and include Subterania, Mau Mau, Rough Trade, Vinyl Café, Maxilla Social Club, the Muse Gallery and The Italian Job. KITTY, DAISY & LEWIS, TOM MANSI & THE ICE BREAKERS, ANNIE BEA, THE PEOPLE PILE, GAZ MAYALL and more!